You are currently viewing archive for June 2005. Ok. I want him. I want us to keep Sheff - and I want him. Can we pull it off? I don't know. Have I watched him closely? Not really. Will the Marlins deal him? Who knows. But, if they do - I want him. I want him over Griffey, Kotsay, Cameron and Encarnacion. Out of those 5 players - he is the youngest at 27. He's a full year and 5 months younger than the next youngest, which is Encarnacion. I'd like us to deal for him and then lock him up. I look at his numbers and the numbers of the other players. The most hits Griffey has ever had in a season is 185. That was an MVP season where he hit 56 home runs and drove in 147. The most hits Kotsay has in a season is 190 last year. 162 in 2003 for Encarnacion. 145 in 2000 for Cameron. Pierre? 221 last year. That's not all, though. He's reached 200 hits 3 out of his first 4 full seasons. If you look at his 4 seasons before this one, you see 2 very good years, a good year and a decent year. This year is shaping up to be a poor year. But, I'm not reading much into this season because bad hitters don't have 200 hits a year for 3 out of their first 4 seasons. Pierre is a good hitter. He's got fabulous speed. He seems to get caught stealing a bit, so that has to be worked on, but look at this lineup. Wednesday night's game between the Yankees and the Orioles was postponed due to rain. No makeup date has been announced, but the likely date seems to be on September 26 before a scheduled three game series is set to open up in Baltimore a day later. Mike Mussina missed a start and will pitch Saturday. Carl Pavano, who was originally scheduled to pitch Saturday, will pitch Sunday. In other news, the NY Times is reporting that Paul Quantrill and Mike Stanton will likely be let go by the Yankees on Thursday, or perhaps traded. Quantrill is 1-0 this season with a 6.75 E.R.A. in 22 games. He has allowed 48 hits in only 32 innings. Stanton was a rock for the Yankees in the glory days of the late 90's, but he has struggled this season with a 7.07 E.R.A. in 28 appearances. It's a tough move to make because Gordon and Sturtze can't do all of the work all the time, but Quantrill and Stanton have not really contributed very much this season. Quantrill has been a bit of a disappointment overall in his stint as a Yankee. Stanton was once one of our key guys, but he is now on the downside of his career and the Yankees haven't had much use for him this season. For a guy like Mike Stanton to have pitched only 14 innings in 77 team games is a bit of a waste of roster space. The Yankees are expected to call up Felix Escalona after the move takes place along with another player, perhaps reliever Colter Bean. One of our own, David Williams was hospitalized on Friday and is headed into surgery. I received an e-mail this morning from his wife, Donna. She didn't say what was causing it, but that he would hopefully be back in action with us here in late July. I will post updates as I hear things and as appropriate. Please keep him in your thoughts. Get well soon, David. The Yankees blew a 4-1 lead last night en route to a 5-4 loss to the O's in extra innings. Chien-Ming Wang put up another solid start, but it was wasted as Tom Gordon could not hold the lead this time in the 8th inning. The Yankees failed to put a run across after the 6th inning. Mike Stanton's only pitch in the game was a walkoff home run into the left field seats by Brian Roberts in the 10th (On a side note, can anybody believe what that guy has done this year? The guy's batting .365 and has 13 homers after having 3 all of last season). The Yankees put up two quick runs in the first but Larry Bigbie quickly closed the gap to 2-1 with his solo shot in the bottom of the inning. Robinson Cano and Hideki Matsui hit their 6th and 10th home runs of the season, respectfully. Rafael Palmeiro hit a two-run shot in the 6th and Miguel Tejada singled in the tying run in the 8th. Brian Roberts' homer in the 10th raised Mike Stanton's E.R.A. to 7.05. I had been thinking that a throwing error by Tom Gordon in the 8th (the error really should've been on Tino) was what ultimately lost the game for us, but in hindsight it didn't really make a difference because Roberts probably would have scored from second on Tejada's single anyway. Larry Bigbie, who reached on the error, did not come around to score. On a positive note, Hideki Matsui is now batting .305, which is actually a point higher than Derek Jeter. His 59 RBI is currently good for 5th in the American League (one behind Miguel Tejada, who many are considering an MVP candidate this season). He has certainly turned things around. I remember at some point in May he was still batting under .250. Anybody here think that Matsui should be given some consideration for the All-Star game this year? According to the NY Post, Gary Sheffield might be on his way to the Mets for Mike Cameron. The Yanks have identified defense in center field, and a sluggishness/lack of athleticism caused by too many older players, as the their main faults. They feel the club's ERA will drop if more fly balls are caught in center and if fewer baserunners take first-to-third liberties. The Yanks, though, have faced a conundrum how to address their faults. Cashman has recommended stopping the vicious cycle of trading the organization's few prospects for expensive, aging players. George Steinbrenner, though, has rightfully demanded not giving up on this season with $200 million-plus invested in payroll. The compromise, therefore, is to see if a core veteran can be moved to solve the issues. The three most obvious are Tom Gordon, Jorge Posada and Sheffield because all are without no-trade clauses. The Yanks are hesitant about breaking up the late-game strength of Gordon, Tanyon Sturtze and Mariano Rivera. Posada remains among the majors' most productive offensive catchers, replacing him would be difficult, and he is likely to vest a $12 million option for 2007 that makes him hard to deal. Obviously, moving Sheffield would weaken the offense, but the Yanks feel they can more easily compensate in that area than others. They are also looking at other players to balance the deal. Some mentioned were Miguel Cairo and a "young Met pitcher." I'm thrilled that the Yankees are looking to move some of their older veterans. Am I happy that they are looking to move Sheffield? No. But Cashman is trying to un-do some of this yuckiness that they've (the front office) gotten the whole organization into. SI.com has this picture feature called The Trade Block. I'll save you from reading it and just tell you what involves the Yankees. Yankees are in the market for: Roger Clemens, Carl Everett, Todd Helton, Aubrey Huff, Austin Kearns, Joe Kennedy, Mark Kotsay, Lyle Overbay, Wily Mo Pena, Mark Redman, Jason Schmidt and Barry Zito. Yankees on the block: Tom Gordon (Mets, Braves). Right now, I'm thinking we go with Giambi (with Tino sometimes) at 1B. So, we skip all the first basemen. I think we need to focus our trades on CF (or LF), then RP, then SP. I think if we get a good CF and add a quality arm to the pen, that'll be a good way to go. If a top SP comes along and we have an opportunity to do something... that's fine, too. I'd like to keep Flash, though. He's pitched well for us. We need more guys like Flash and not less. The same thing would be said (for me) about Posada and Matsui, who have been rumored in trades. Trading either one would be a step back, I feel. "I saw some special on TV last night comparing me and him, and I'm like, "What are these guys doing? Are they serious?"" I still flinch when Jason Giambi comes to the plate. It's something that I can not control, and probably no doctor could fix. But the medicine I need to shake off this disease of seeing a .256 AVG or below player come to the plate was obtained last night. Jason Giambi drove in the winning runs when he hit a 2-run single off of Braden Looper of the Mets to take the game 5-4. The quote of the game came from Torre when taking Randy Johnson out of the game after 6 2/3 innings pitched. "He wanted to finish the inning," Torre said. "I said, 'It's the second trip, so I can't do anything about it. I'd love to leave you in, but I can't do it.' I was glad he let the ball go." Play of the game was of course Jason's 2 run single, followed by Tino working a walk to start off the inning. Torre just replaced Russ Johnson with Tino as a pinch hitter. An interesting note is that the last 2 games the Yankees have won both come from when Randy Johnson pitched and the Yankees came from behind to take the game. An important series starts tonight in Baltimore. Carl Pavano (4-6) takes on Daniel Cabrera (5-7) at Camden Yards. Starting time is 7:05pm EDT. Despite 11 hits and 2 walks, the Yankees just couldn't get the runners home. Robinson Cano knocked in all 3 runs as he went 2 for 3 with a 2B and a HR (his 5th of the year). A-Rod, Matsui and Giambi had 2 hit days, as well. The only Yankees to go hitless were Sierra and Posada - they were also the 2 batters who left the most runners on base (4 a piece). The Yankees pitchers walked 6 and allowed 14 hits, which amounted to 10 runs for the Mets. Cliff Floyd was the star of the day, going 2 for 3 with 2 HR, 3 R, 2 BB and 4 RBI. Rookie Sean Henn only lasted 4 and 1/3 (6 ER) before being yanked. Henn is now 0-3 with an 11.12 ERA. I'm not saying he'll never be anything, but I think we've seen enough of him. Let Ruben pitch or bring up another rookie - or something. Proctor allowed 1 unearned run in 1 and 1/3 innings, Stanton came in and allowed an ER (did not retire a batter), Quantrill pitched 2, allowing 2 runs earned with Groom finishing the game with a scoreless 9th. All in all a forgettable game. The Unit will look to rebound against Kris Benson tomorrow. Former Yankee Jay Howell recounted an encounter he had with George Steinbrenner back in 1983 for Murray Chass and the New York Times. As Steinbrenner kept going, Howell remembered a piece of advice offered by two veteran teammates, Rich Gossage and Ron Guidry, that a player must hold his ground with Steinbrenner. So, Howell said, he stood up and said: "George, I may be 1 and 4, but I go out there and do my best. You've never heard me blame anybody else." At that point, Howell related, "He leaps across the desk, clasps me around my back and says: 'Thatta boy. You're going to be the next Allie Reynolds.' "
The Devil Rays have now just won 8 games on the road this season. Before this last series with the Yankees, they've only won 5 on the road. Ugh! This is what makes this a hard pill to swallow. The Yankees lost to the Devil Rays last night 9-4. The Rays took the series 3 games out of 4. It would have been a sweep only if the Yankees didn't unleash terror with their bats in the 8th inning of game 2 in the series. Wang was not his usual self last night tossing 6 innings and giving up 6 Runs - 5 ER. Keep in mind that he did pitch one spectacular gem this past Saturday against the Cubs. They took him out to keep him fresh for the start last night. Apparently that didn't work as he gave up 8 hits, and 2 of those were home runs from Jorge Cantu who drove in 4 runs for the night. The Yankee bats were silenced after scoring 4 runs in the 3rd, they couldn't make anything happen. As A-Rod said, "They pitched well, they played good defense ... and [Hendrickson], it was one of those things where he kind of had us sleeping." Sleeping? They had a great impersonation of Sleeping Beauty in which the "Beauty" not comes from physical attractiveness, but from the number of digits in their salary. Jeter asks, "Who do we play next?" That would be Pedro "The Yanks are my Daddy" Martinez (7-2) against the Moose (8-4), tonight at the Stadium. 06/23: Deja Vu All Over Again? Just a day after turning a 10-2 defecit into a 20-11 roasting, the Yankees bats were cooled off this afternoon as they were defeated by Scott Kazmir and the Devil Rays 5-3. Gary Sheffield launched a two-run homer in the first inning (his 3rd in two days), but that was pretty much all the offense the Yankees got save an RBI groundout by Robinson Cano in the 5th. Carl Pavano looked solid through 6 and 2/3 until he gave up a three-run shot to Nick Green which put the Devil Rays up for good. The Yankees are now a Major League-worst 0-25 when scoring three runs or less. I don't think tonight's game was as much a failure of the Yankees' offense as it was a great performance by Scott Kazmir. Although this is his first full year in the Majors and he is very young, he is still one of the toughest pitchers to hit in the league if he brings his "A" game. He hasn't been totally consistent so far, but when he is on he is almost lights out. As for Pavano, I was watching "Mike and the Mad Dog" on the YES Network a couple hours after the game and they were saying they don't understand how people can say that if he hadn't given up the home run to Nick Green you could call it a good start. They do make a point because when you look at the line score you see the 5 earned runs and the two homers and 6 hits in just over 6 innings. However, I do think he was pretty solid throughout most of the game. Take away the three-run homer and his line score is 7 innings and 2 runs on 4 hits. I really couldn't argue either way. The fact of the matter is that he did give up the home run and that is just as much a part of the game as everything that happened in the 6.2 innings before the home run. So I guess what I'll call it is a mediocre to forgettable outing although this one start alone is nothing to worry about. Tomorrow evening the Yankees will send Chien-Ming Wang to the mound to face the D-Rays' Mark Hendrickson before finishing up the homestand with a weekend series against the Mets. I think tomorrow's game is critical especially considering that the Red Sox keep winning now and have closed the gap on the O's to one game, and it would really be a blow to what the Yankees have accomplished so far on this homestand if they lose 3 out of 4 to Tampa Bay at the Stadium. Before today's game, most people probably would have thought out of the four games the Yankees and Devil Rays play this week, tonight's would feature the best pitching as Randy Johnson went up against Hideo Nomo. However, that was not the case tonight as the Yankees came back from an eight-run defecit to defeat the D'Rays 20-11 in a game that saw 41 total hits (23 by the Yankees) and nine home runs (six by New York). The Yankees started to rally in the 5th after trailing 10-2, but the most memorable inning of tonight's game was the bottom of the 8th in which they scored 13 runs to turn an 11-7 defecit into a 20-11 lead. The Yankees hit four home runs in the inning, including back-to-back-to-back home runs by Sheffield, A-Rod, and Matsui. All three Devil Ray home runs came off of Randy Johnson as he failed to pitch more than 3 innings and Hideo Nomo came out of the game in the 5th after giving up 5 runs. Every Yankee starter had a hit in the game except John Flaherty (Posada pinch hit for him in the 5th, went 1-2 with a two-run homer). Derek Jeter had 5 hits including a home run and was only a triple away from the cycle as he raised his batting average to .309. Gary Sheffield was 4-6 hit two three-run homers and Hideki Matsui also had four hits including a home run, which I might add went pretty deep into the black seats. Alex Rodriguez added his 20th home run to re-grab a share of the Major League home run lead. The Yankees have now won 7 out of their last 8 games and kept pace with the Orioles, who also won tonight, to stay 5 games back in the AL East race. Tonight was the second time this season that the Yankees scored 13 runs in an inning. Both times were during home games against Tampa Bay. The Yankees six game winning streak ended on Monday night to the lowly Tampa Bay Devil Rays. The Yankees brought up Sean Henn from Columbus to start for Kevin Brown who was just placed on the DL. Henn was brought up once before earlier in May for Randy Johnson and also faced the Devil Rays. This outing was not much better. He walked seven in 4 2/3 innings and seems simply not ready to pitch in the major leagues yet. He walked four in the second inning to force in a run. The next batter hit a grounder in the hole between second and third which Jeter got to but the only play he had was to try and force the runner at third. A-Rod got to the bag but couldn't get into a position to reach over the runner and the throw went wild allowing two runs to score. Casey Fossum was great for Tampa Bay until the eighth inning when the Yankees started to get to him. He was replaced by Lance Carter who surrendered a three run homer to Matsui to get the Yankees to within one run at 5-4. Rivera entered in the top of the ninth for the Yankees and was a bit wild by allowing two walks but got the three outs without giving up anymore runs. Tampa Bay replaced Carter with closer Danys Baez who pitched a perfect ninth inning for only his second road save of the season. The Yankees lost a game to Boston who held on to beat Cleveland 10-9 but did not lose any ground to AL East division leader Baltimore who were crushed by the Blue Jays 11-2. The Yankees try to start another winning streak tonight with the Big Unit Randy Johnson on the hill against veteran starter Hideo Nomo for the Devil Rays. Johnson has been awesome in his last two starts and New York will be looking for him to dominate Tampa's young lineup. ESPN.com used WhatIfSports.com to face the 2005 Yankees against the Ex-Yankees currently in the league. The current Yankees set them down 3 games to none. Looking at the ex-Yankees roster, I can see why. Some great players, sure. But, a bunch of guys I wouldn't want back or don't care either way, really. Plus, its not that we could have had all of these guys on the same team. A-Rod's (Soriano) and Unit's (Johnson, Javy, Halsey) don't come cheap. Yankees starter Mike Mussina added another feather to his cap today by beating the Chicago Cubs 6-3. "The Moose" (8-4) won his 3rd straight start in the process behind the bats of A-Rod and Matsui. Sergio Mitre (2-2) took the loss in giving up 6 Runs - 5 earned in 5 2/3 innings. It is interesting to note that the Cubs are 4-8 in interleague play this far into the season, and one would think they are looking forward to playing in their own league. The Cubs also look sloppy on the field, reminding myself of just how the Yanks looked a few weeks ago. One highlight for the Cubs has to be Jeromy Bernitz - he seems to have a hot bat right now. Pair him with Lee, and then get Wood and Prior back from the DL, then look out! In Yankees highlights, A-Rod stole 2nd in the 6th, and then Matsui knocked him in to put the game further out of reach. That play, and the play in the 7th when Tanyon Sturtze got Neifi Perez to ground into a 1-2-3 double play to end the inning with the bases loaded, stood out to me in how the Yanks are turning it around. The team really seems to be clicking now. They are in sync at just the right time (they are home). They are ready now to face the Devil Rays, the worst team in baseball. Lets see if the Rays give them a tough series as the last time they met. The first game of that series is tomorrow night with just called up Sean Henn (0-1) taking on Casey Fossum (2-5) at the Stadium. Happy Fathers Day to all of the fathers out there. 06/18: Who Should We Sponsor? So, we all know how great Baseball-Reference.com is. They have a sponsorship program where you can sponsor most pages on the site (including player pages) for a certain fee (varies by page). You get a link on the page in exchange. For taking a couple of survey's, I have $4 in my account over there. So, what I was thinking was this... go to the available pages page (or do searches at BR, you're choice) and find a page that you think it'd be neat for us to sponsor. I don't really want to go any higher than $15. If it's really good, I might be able to go $20. Could that be Red Ruffing? Traded from the Red Sox to the Yankees - turned into a Hall of Famer. Or Sparky Lyle? I ran through the top Yankees in games played and came up from Frankie Crosetti (11th) and Earle Combs (17th). Perhaps the World Champion 1939 Yankees? The Iron Horse's final year. Or the World Champion 1941 Yankees? The 1949 World Champion Yankees? The 1950 World Champion Yankees? Jack Chesbro? Perhaps Gerald "Ice" Williams, possibly the only man to get a shot in on Pedro Martinez? Coming into the game, among active players, Derek Jeter had had the most at bats (136) and home runs (156) without a grand slam of anyone in baseball. With 1 out in the 6th, Jeter homered to deep center to put the Yankees ahead 7-1. D. Jeter finished the game 2 for 5 with 2 HRs (he added a solo shot in the 8th) with 5 RBI. Chien-Ming Wang pitched a brilliant 8 innings, throwing 88 pitches (57 of them for strikes). He allowed 1 ER (a solo HR in the 6th) and 5 hits, bringing his ERA down to 3.97 and uping his record to 4-2. Not to be lost in the mix were 3 hit games from Bernie (3 for 4, 1 R) and Sheff (3 for 5, 1 R, 1 RBI). The Yankee offense combined for 13 hits and 3 walks. Cano scored 2 runs, as did Jeter. I watched much of the game (had it on while working) and the Yankee defense looked good. A-Rod made a couple of nice plays. All in all, a satisifying victory that puts us 3 games over .500 and 4.5 back of the first place Orioles. Moose goes against Sergio Mitre tomorrow. Trade speculation is always rampant in the Bronx and the latest scenario making the rounds had the Yanks dealing for Ken Griffey Jr. One Yankee official said simply, "Not happening," when the situation was posed to him. From the New York Post: Bombers in Chase for Mets' Cameron. The Yankees aren't ruling out the possibility of asking players such as Hideki Matsui and Bernie Williams to waive their no-trade protection if teams are interested enough to give something good in return for them. "They're talking about almost everything," an official with a National League team said. "They're talking about players who used to be off-limits." The Yankees also would consider moving their two impressive rookies, pitcher Chien-Ming Wang and second baseman Robinson Cano, to teams that are out of the race and looking to make veteran-for-prospect deals. But that will cause a rift in the organization, as some believe the Yankees should keep Wang and Cano and build their future teams around them. I'm not into trading Posada, Matsui, Bernie, Sheffield, Mussina or Mo. I think we need more guys like Matsui, not less. And I'd prefer not to trade Cano, Wang and Gordon, but, if we are going to trade, where does it come from? Going to have to be the minors. Via Off the Facade and Pro Sports Daily. Hideki Matusi had a five RBI night with a RBI single, a two run homer and a two run double. The home run put the Yankees back ahead to stay at 7-6 in the seventh and the double provided additional insurance in the eighth for Rivera to end the game at 9-6. The Yankees really beat up the Cubs bullpen by hammering Ohman, Wuertz and Remlinger after demonstrative Carlos Zambrano left the game. The Yankees had a 4-0 lead but the Cubs battled back against Pavano to eventually take the lead 6-4 on a two run single from catcher Henry Blanco. In the seventh the Yankees battled back with A-Rod delivering Sheffield from second with a one out single up the middle just prior to Matsui's go ahead homerun. The difference proved to be the Yankees bullpen with Quantrill, Stanton, Gordon and Rivera not giving up any runs. The Yankees still need to do something in left field. Tony Womack isn't the answer. He looks very uncomfortable, has no arm to speak off and it appears that he really doesn't like the experiment. With Cano firmly in charge of second base it appears that Womack is prime trade bait. The San Diego Padres are without Mark Loretta and may try to acquire a veteran like Womack for the pennant race. The Yankees are only obligated for a two year contract for $4 million which for the Yankees is pocket change. If they could get some bench help from San Diego or a couple of minor leaguers I think Womack isn't long for the Big Apple. The rumor mill has the Cincinnati Reds thinking about dealing any or all of their outfielders. Could Junior be headed to NY to play center? 06/17: Barry Zito? Preston Wilson? A person who spoke to Cashman recently confirmed Cashman is pursuing a significant deal. "It sounded like he was close on some stuff," the person said. "He's working it." 2. Tony Womack, Chien-Ming Wang, and Sean Henn for Barry Zito. It sounds like a lot to give up, but Wang may be overachieving and Henn may yet not amount to much. Also, picture this: Randy Johnson, Zito, and Mike Mussina going 1-2-3 in a playoff series. In the meantime, while Wright is hurt Tanyon Sturtze can undoubtedly become the fifth starter if the Yanks fail to obtain another starter in a trade. We should qualify this deal by saying that Zito is the only player for whom Wang should even be considered packaging for. On Wilson: He'll turn 30 in under a month and (I believe - might be wrong) he is in the last year of his contract. He is having a decent offensive year (low OBA, as he always has), but that could, of course, worsen when he leaves Colorado. He used to be quick (36 SBs in 2000), but his SB totals have dropped off a bunch (read: basically zero) in the last two years. I haven't been watching him, so I don't know exactly how good his defense is. Being the last year of his contract, he'd be our "adequate" CF to get us through this year, then we let him go and find someone next year, presumably. Bernie is backup OF and DH while Giambi is backup 1B and DH. On Zito: Last year, 11-11 with a 4.48. This year, 3-7 with a 4.47. A bit removed from his Cy Young season of 2002 where he went 23-5 with a 2.75. I haven't been paying too much attention to him, either. Is there a problem? Is it because the A's aren't doing well? Losing Womack doesn't bother me as he's hitting .240 something. Wang has been good and I like him. So, the question is if he is performing above himself or not... who knows, really. Could be. And then you have another prospect in Henn. Henn's 24, Wang's 25. Zito is only 27, of course. And he's a lefty, as is Henn. From what I've read, Zito is signed to his modest deal through 2006, so we'd have him for two years at least (obviously the idea of the trade is for him to pitch well and then we extend his contract... some of the 15 million that Brownie opens up next year could go to that). The issue with the trade, for me, is mainly Wang because of the way he's pitched. But, it's not like we'd really be getting that much older. Zito 27, Wang 25. Zito has a Cy. Zito is an "ace", although he hasn't been pitching like one in the past 2 years. Wang's ERA is only 3 points lower than Zito. If Zito was in NY, would he have a better record/a lower ERA? I don't want to trade Wang, as I've said before, but if he is tradeable, this is the kind of deal we need to trade him in. A deal for a top, young/reasonably young SP. Are there many Zito's available out there? Probably not. I don't think I'd be complaining if both deals went through, although I'm not sure just how good Wilson is or why Zito has had some trouble in this and last year. I finally agree with Rick Sutcliffe. I'll have to mark this down as a first. Would firing pitching coach Mel Stottlemyre or hitting coach Don Mattingly help? "That's not the answer," Sutcliffe said. "This game always has been and always will be about players. That will never change. You are not going to fool the players in the clubhouse by doing something with a Stottlemyre or Mattingly. They know. Players know it is not [Stottlemyre's or Mattingly's] fault. That is not going to be a good move. This team should turn it around no matter what they do. Even if they didn't do anything." Yanks fans... hold on to your caps... the season is not over yet. Not by a long shot. With Randy pitching the way we thought he could, throwing 11 K's against the Pirates and only gave up 5 hits in a complete game. Giambi, who hit a game winning walk-off home run the previous night, came in to smack an RBI double. He also walked and was hit by a pitch. It is obvious he is hitting the ball better. It's also interesting to note that Posada did not catch again for RJ. Backup catcher John Flaherty had the honors for the Unit for a 2nd straight start. Matsui, still playing on his badly injured ankle, hit a 2-run homer in the first. He is certainly excelling at the plate since the injury. It's Pavano against Zambrano at the Stadium tomorrow night. I thought it might be fun to check out what type of years the Yankee hitters and Mo are pace to have. Obviously, this only works with players that have been generally healthy. I'm going to stick to guys that have been with us for the whole season and are everyday starters. I've left batting average and OBA off because, obviously, they are on pace for what they have now in those categories. This is calculated by taking the players current numbers, dividing them by the number of team games played so far and multiplying that figure by 162. It is then rounded down to the nearest whole number. So, for instance, Jeter has played 62 games out of 64, so it is estimated based upon him playing nearly 157 games. A-Rod has played 64 games, so his estimates are for him playing all 162, since he has played all 64 so far. Not a perfect method, but seems like it's as good as any. Don't look now - but Mariano hasn't allowed an earned run in a month and 10 days. In fact, since the opening Boston series, he's only allowed 1. 1.09 ERA would be the lowest of his career. If Mo is done, what's Foulke (on pace for 32 saves with a 5.40 ERA)? That's what I'm wondering. On pace for a solid year. 146 hits would be the highest total of his career. Actually on pace for a worse year than last year despite a higher BA and a much higher OBA. Slugging is down. Still a good year, though. On pace for a monster year. 48 home runs would be the most home runs for a Yankee since Maris (61) and Mantle (54) chased the Babe in '61. 141 RBI would be the most for a Yankee since Tino put up that number in 1997. If he was to stay on this pace, he'd be a top candidate for the MVP award, given that he's 4th in batting average, 1st in home runs and 1st in RBI. Outside shot at the triple crown if the guys ahead of him in the batting average standings cool off a bit. 45 doubles would be the highest total of his career. 108 RBI would tie for the highest total of his career. 12 home runs and 172 hits would both be the lowest of his career, but 172 hits is close enough to the 179 in his rookie year and 174 last year. On pace for a better season than last year in hits, doubles, stolen bases, average and OBA. But, runs, slugging and RBI are all down a solid amount. Still, a very good year. ESPN.com has the all star voting results through Monday. Tino is the leader at 1B, Womack is 4th at 2B, A-Rod has a huge lead at 3B, Jeter is 2nd at SS, Posada is 3rd at catcher, Sheffield is 5th in the OF, followed by Godzilla at 6 and Bernie at 11. Finally, Giambi is 3rd at DH. Mussina pitched a 5 hit, 6 K, 1 BB shutout as the Yankees trounced the Pirates 8-0. Every lineup spot came up with a hit except for A-Rod (who was hit by a pitch twice) and Womack. Cano, Matsui and Posada each added 2 hits of their own. Sierra, Posada and Giambi each had 2 RBI. Brown goes against Mark Redman tonight. For the first time in nearly forty-five years, actually since October 13, 1960 when Bill Mazeroski hit a World Series winning homerun off of Ralph Terry the Pirates and Yankees will face each other tonight. The three game series starts tonight at the stadium. Believe it or not the Pirates actually have a better record then the Yankees. The Pirates payroll is only a fraction of the Yankees $200 million plus amount. The Yankees should and need to sweep the Pirates. They are much better and need to play like they are. On Saturday afternoon a national television audience saw what the Yankees could be. They had Randy Johnson dominating a very good first place team lineup. The Yankees had timely hitting and great closing relief from Mariano Rivera. Kip Wells is on the hill for the Bucs and Mike Mussina gets the start for the Bombers. They have to put a win streak together on this thirteen game homestand. After the Pittsburgh they play the Chicago Cubs, Tampa Bay Devil Rays and the New York Mets. They need to go at least 9-4 on this homestand. After the homestand they finish out the month of June against the first place Orioles in Baltimore. The Yankees went only 3-9 on this just completed road trip. Actually, they lost only two games to the Orioles during the trip. It would be great if they could get the lead down to about two or three games during this homestand. There are rumors that Joe Torre is in trouble and maybe Lou Piniella will be managing the Pinstripers next year. Piniella is really fed up with the Devil Rays and their reluctance to commit to winning. Is Piniella what the Yankees need? A fiery, no nonsense, hard nosed attitude is exactly what the Yankees need. They are too inconsistent and make way too many mental mistakes. As times they appear to only be going through the motions. Hopefully this will not be like the Royals series. The Yankees were able to put together 10 hits and 4 walks allowing them to score 5 runs. Only three lineup spots failed to get a hit (Tino (1B), Cano (2B) and the pitcher spot). They were able to score the runs without a single home run. 4 of the runs came with 2 outs. 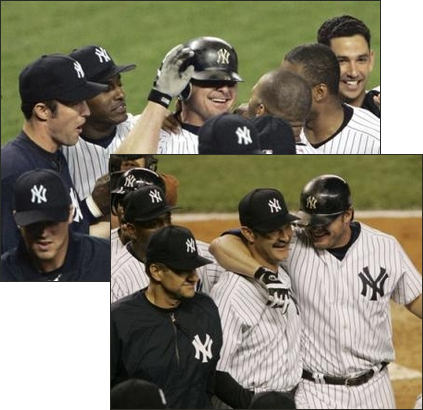 Jeter, Matsui, A-Rod and Bernie each had 2 hit days with Jeter and A-Rod both having 2 RBI (Matsui had the other 1). Flash relieved the Unit in the 8th and got two outs. Then he took a ball off his right hand and came out (he'll be alright). Mariano relieved him with 2 out and men on 2nd and 3rd and struck out Larry Walker to end the inning. He then worked a 1-2-3 9th (Pujols, Sanders, Grudzielanek). His ERA is down to 1.19. Yeah, he stinks. The Cardinals came close to scoring a run in the 4th, but Matsui easily threw out Reggie Sanders at the plate to end the threat. Pavano will take on Matt Morris today as the Yanks look to get back to .500.
Who wants to watch Cubs/Red Sox? My brother told me the game was on today... which it is in some markets, but apparently not this one. Oh well. No live blogging for me today! 06/11: "This is the worst." Words spoken by Torre last night after the Cardinals blasted the Yankees 8-1 in St. Louis. Chien-Ming Wang gave up 7 runs in four innings, although only 4 of those were actually earned runs. What this means is the Yankees played very sloppy in giving up 3 errors. Those were the only counted errors as the Yankees played unenthused baseball all through the night. Jeter, who hardly ever says anything worth a quote, came up with some big ones last night after the game. Jeter says that "everyone is letting each other down." He also added, "...we're playing like we don't care..." Ouch! Alot of us fans bleed in pinstripes, and to have the captain come up and admit that they don't care? Even if he took a few steps back from that comment... he still threw it on the table. Torre also admited that he didn't have the players ready to play. Whatever that means. If you are in the big leagues and don't come to play each and every night, that is when we start talking about your heart and desire. Do the Yanks have that right now? When things are going bad the manager has to do something crazy and unconventional to jump start the team. Joe Torre did just that as he canceled batting practice and sat Matsui, Giambi and Posada. The result is that it worked. A-Rod hit his first of two homers in the first inning after Sheffield reached on an error by the third basemen. Mike Mussina gave the runs right back but then Tino Martinez hit a clutch two run double to put the Yankees ahead to stay. A-Rod's first inning home run was the 399th of his career but he wasn't finished. He added his 400th career home run late in the game and became the youngest player in history to reach that plateau at 29 years and 316 days old. The question now is can the Yankees take this offense and continue it against the first place St. Louis Cardinals? The pitching matchups are Wang vs. Marquis on Friday, Johnson vs. Mulder on Saturday and Pavano vs. Morris on Sunday. Each Cardinal pitcher has seven wins already this season. The Saturday matchup is really intriguing with new Cardinals ace Mark Mulder going against the struggling Randy Johnson. Johnson will have to face a potent lineup on the road in a nationally televised game of the week on FOX. He really hasn't pitched that bad and if the Yankees were the real Yankees, he would have won his last two starts. Pavano also looked great in his last start, giving up only two runs on a homerun but in a losing effort due to the Yankees lackluster offense. The question for now is are there more shakeups on the way? Paul Quantrill has been getting rocked and it is becoming very clear that Joe Torre has lost confidence in him. He is not used in the seventh anymore unless Sturtze or Gordon have been overworked. Even the outs he got the other night were on balls that were crushed. We still need a lefty reliever. Buddy Groom and Mike Stanton are too inconsistent and can't be counted on in clutch situations. Will Roger Clemens end up in the Bronx or could the Texas Rangers lure him into their pennant chase? It is clear to me that the Yankees need to improve in many areas. They need another starting pitcher to beat contending teams and make the playoffs. The Yankees outfield defense is atrocious. None of the Yankees outfielders can go back on balls that are close to the wall. Sheffield looks awful, Bernie is simply too old and Matsui just misjudges too many balls when playing either left, center or right. In addition, Sheffield is the only one that has any kind of arm. Who do we use as trade bait? Would the Yankees let go of Matsui to get Clemens? Is Junior Griffey a possibility? You can't get rid of Cano, the kid looks like he has the goods. He is smooth at second, his bat is getting better everyday and he is starting to hit with power. Womack has been a huge bust, if they can move him for a lefty reliever I say do so now. 06/08: Can Anybody Explain This? The Yankees' bats failed us once again tonight, as they wasted a solid start by Carl Pavano and lost to the Brewers 2-1. The Yankees have now lost 9 of their last 10 games and are 0-21 in games in which they've scored three runs or less. I would've posted more blog entries over the last few days, but I really just don't know what to say. There seems to be no real explanation as to why the Yankees are struggling the way they are. One day it's the inconsistent starting pitching. The next day it's the hitting. The day after that the key relievers in the bullpen are being overused. Is this team just in a horrible funk or are the Yankees simply a 28-30 team? I think this team is still capable of winning the World Series if they get their act together. For most of May, we've seen that they're at least capable of playing great baseball. Most of the players on the team were here last year and they won 101 games. I don't think they are going to win that many games this year, but I think they can still win 90-95 games and make the playoffs. What kills me the most about this team is the production at the bottom of the order, in which case I'm really talking about everybody who hits after A-Rod. Some of those guys down there have had key hits, but when the team is struggling, it seems almost as if all the 6-9 batters are automatic outs. Even the once red-hot Robinson Cano is now batting .245. For most of these guys (I'm talking about the whole lineup), I really think that they are pressing too hard. A lot of times when the players surrounding a guy aren't hitting, he feels that he needs to carry the team and hit a bunch of home runs. I think I've seen that a bit from A-Rod over the past week. It's almost as if the team's struggles are hurting players' individual games when it is usually the other way around. Hopefully the Yankees can grab a victory tomorrow night in Milwaukee. You don't want to go into St. Louis having lost 10 of 11. 06/06: Should we be worried? Or should Mel? "Some days you don't have the pitches," said Kevin Brown, who gave up five runs, eight hits, walked two and drilled two more in 51/3 innings. "Today I was limited to what I could and could not do." "We got the lead, and Moose pitched very effectively early. Then he just fell apart," Torre said, a terse postscript to another numbing evening of Yankees ball. "There's not much you can say, other than he didn't make his pitches." "I don't know if frustrated is the word," Pavano said. "The [Yankees] definitely needed a solid outing from me to win this game and avoid a sweep and I didn't pitch well at all. My job was to go out there and help the team and I didn't. "All of the things that made the last month good, all the weapons I had -- the ability to throw breaking balls for strikes, to throw the fastball in and out -- I didn't have any of that today," Mussina said. "It's tough to pitch against any lineup -- let alone theirs -- without any weapons. I didn't have any today." We live and die by our pitching. Honestly, there were two games where our bats lost the game for us. The Kevin Brown and Unit losses to KC - those were two games that were well pitched and both pitchers kept us in the game. As I've said before, I'm a firm believer in that it is the players job to get the job done. Not the coaches. They are the talent that the Boss pays, and sometimes overpays, to pitch for the Yankees under the big lights of NY. That being said, I'm also a believer that it takes more than clicking your "pitch-count-thingy" and walking out to the mound for a discussion with the pitcher after he has already given up several runs and putting the Yankees in a bigger hole. Sheesh, somebody wake up our pitching coach!! And lastly, ever notice that since Quantrill tagged that Detroit player he has, as Wade Boggs used to put it, "stunk up the joint"?? Rant over. I feel better. Before I start, let me say that I have nothing against Jaret Wright... I look forward to him pitching well for us. But, right now, if we have all 6 starters healthy (when and if he gets back)... the first thing I think is "Jaret is headed to the pen." As easy as it would be to say "stick Kevin Brown down there" - I can't. The rotation has improved and the emergence of Chien-Ming Wang as well as Brown's turnaround make the waters murkier. It's a nice problem to have, as Mr. Torre has probably said (or would, if you asked him). If it's me and all 6 are available, Wright is not starting right now. He's in the pen. At the same time, we may never have all 6 healthy. Things happen. Who knows how close Jaret is to coming back... could be a set back. I hope there isn't, but there are so many variables in having all 6 healthy. But, the stars could align. If we do, what do you think we should do? The Yankees got their first victory since last Friday as they came back from a three-run defecit to beat the Twins 4-3 in 10 innings. Chien-Ming Wang gave us another decent start, going 7 innings and giving up 3 runs on 5 hits. Robinson Cano launched a 2-run double in the 5th to cut the Twins' lead to 3-2. Gary Sheffield scored the tying run on an RBI groundout by Hideki Matsui, and Ruben Sierra brought Matsui home with a sac-fly for the go-ahead run in the 10th. Mariano Rivera recorded his 13th save and now has his E.R.A. at an impressive 1.33. Well it's good to finally get a win under our belts again. For much of the game it seemed like the Yanks would go down for their 7th consecutive loss, but the fought back. It wasn't the most impressive win, but it's definitely something to build on. It has also come to my attention that despite all his struggles this season, Hideki Matsui seems to be in the middle of everything for this team. Today he brought home the tying run and scored the winning run in the 10th. On the box score it looks like a sub-par 1 for 4, but he produced half of the Yankees' four runs last night. His average is at an un-Matsui like .271 and everybody knows about his power struggles, but he has scored 34 runs this season and driven in 38, which I'm pretty sure puts him on pace for over 100 RBI and 100 runs scored, since the Yankees are about a third of the way through the season. He's not putting up the best numbers of his career, but he is producing. With the Yankees being so pathetic, as fans we need to look for some edge or advantage. Perhaps that edge is not having to face Brad Radke or Johan Santana in this weekend's series against the Minnesota Twins at the Metrodome. However, we couldn't beat the newbies from the worst team in baseball. Did the Yankees feel they could put it on cruise control and just win by showing up? The team was so flat! When it looked like we had a chance to rally, a bone head play would appear. Case in point, Tony Womack gets picked off first with one out and a runner on third and the Yankees lose. Are we maybe just an outfielder and a good starting pitcher away from the World Series? At times it seems this is the answer. At other times it appears the Yankees are an aging team that just doesn't click together. Do we need a major shakeup? Does someone like Posada, Womack or Bernie Williams need to be traded and try to get and influx of youth onto this team? The answer has to be Derek Jeter leading the way. He is the captain and has to probably convene a players only meeting and just get in players faces and clear the air. The Yankees are much better than they showed against KC and probably can beat anybody if they play up to their potential. Mike Mussina goes tonight and he has a very good lifetime record against the Twins. The hitting just has to get better. Where is the big inning? Where is the three, four or five homeruns in one game? Where is the big stolen base? Has anyone seen Mariano Rivera lately? He is like the Maytag repairman, we never need him. Rest assured, George Steinbrenner will not sit still and wait for long. He will make changes soon and will not tolerate this level of play. I look forward to the Moose starting us off on another winning streak and Mo getting the save. Yankees fans just need to keep the faith. Are the Yankees on life support? Or are they in a coma? The Yankees just got swept by the worst team in baseball. The same team who as the second lowest payroll in baseball. Tonight 7 hits, 2 runs scored. Last night 7 hits, 1 run scored. The night before, 5 hits, 3 runs scored. It goes on... for the entire series with Boston: under double digit hits for each game, with the Yankees being outscored 27 to 9. What will it take to enfuse some energy back into the team that was rolling previously? It remains to be seen. The Yankee pitching has been pitching effective enough to keep them in the game, but its been the anemic bats. Its been the paltry baserunning. And something that just should not happen, its been the weak fielding. Excuses? Yes, but very truthful. I have a feeling this will be a l-o-n-g roadtrip. Randy didn't pitch a bad game - CG (8 IP), 3 ER is not a bad game. The offense has to be able to muster more than 1 run (a Bernie Williams solo shot in the 9th). The Yankees managed 7 hits and 3 walks and the Royals managed 9 hits and 1 walk. Yet, they score 3 and we score 1. Hopefully we'll get back on track with Pavano tonight, his first start since the 17-1 game against the Sox behind him. Nice story in the New York Times today. When George Steinbrenner, the principal owner of the Yankees, was told of Ms. Smith's steadfast presence, he was thrilled. "I was touched to learn that she considers the Yankees as her family," Steinbrenner said. "We're proud to have people like Nancy filling our seats and cheering the Yankees for so long - she's a breed apart." Minutes before the game, the Yankee manager, Joe Torre, wearing a full grin, leaped off the bench to greet Ms. Smith. "I'm getting a kick out of this," Torre said to her. "You've been to more games than I have." Ms. Smith, treated to dinner by the Yankees at their Stadium Club before the game and given a scorebook delivered straight from the Yankees dugout, got another surprise in the bottom of the second inning. Alex Rodriguez, the Yankee third baseman, who was swinging a bat in the on-deck circle, suddenly wheeled around toward the owner's box. "Are you Nancy?" Rodriguez asked. Ms. Smith, slightly startled, nodded yes. "Thanks for coming out again," Rodriguez said. By the bottom of the sixth inning, Ms. Smith, glasses on, head down, was hard at work on her scorebook. Deep in thought, she did not hear Derek Jeter shout, "Hey, Ms. Smith!" So the Yankee captain gave it another try. "Hey, Ms. Smith!" he cried out again. This time, Ms. Smith looked up, her eyebrows pointing north. "Nice to see you," Jeter said.